Can I Play Hot Spot Online? Read 6 Reviews! Hot Spot and Bulls-Eye California Exposed — Are You Good at Keno? Do you love keno games and do you live in California? If so, you’re in luck, my friend! Hot Spot is one of the California State Lottery games and it’s a keno-style quick-draw game. While this may be sufficient for some people to give the lottery a try, others may need some additional details. Here’s a comprehensive Hot Spot review featuring all of the essential information. The quick-draw game is a descendant of a previous keno-style option offered by the California State Lottery. An update in the rules took place in the summer of 2011 when players got an opportunity to choose any number of spots in the range from 1 to 10. This is the time when a higher top prize was also introduced for the 10-spot play. Hot Spot drawings take place every single day. The cost of the minimal wager is 1 dollar. If you choose to play a bigger number of spots, you should be prepared to spend more money on the ticket. The most expensive game entry is the 8-spot one and it costs 10 dollars. Is California Hot Spot a Scam? 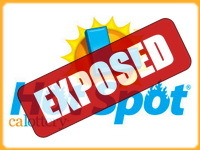 Hot Spot is an official entry in the California State Lottery portfolio. The California State Lottery was established in 1984 after the California approved the California State Lottery Act. The aim of the act was to generate funding for schools in the state without an increase in taxes. Ever since those early days, California State Lottery has been expanding its portfolio. Some of the most popular lotteries available in the state include Daily 3, Daily 4, Daily Derby, Fantasy 5, SuperLotto Plus, Mega Millions and Powerball. California State Lottery is a completely legitimate entity and you can pick among the game that it operates without ever worrying about a rip-off. Not only that, any money you spend on the purchase of a ticket will also be used to support educational causes of California. The feel-good factor is a strong one on top of the desire to win some cash, don’t you think? How to Play Hot Spot? Hot Spot is a bit more challenging than standard lotteries so please bear with us! Once you’re done with this section, you’ll have a pretty good idea about what it takes to win money with this fun California game. When buying a ticket, you’ll have to pick the spots (the sets of numbers) that you want to play. The number of spots include 2, 3, 4, 5 or 8. Once you’re done with the spots, choose your set of numbers in the range from 1 to 80. The numbers that you mark should be equal to the number of spots that you’ve chosen. Apart from the standard entry, Hot Spot comes with a Bulls-Eye feature. To play Bulls-Eye, you’ll have to spend an additional dollar on top of the base wager. The Bulls-Eye functionality is obviously there to give you an additional chance to win. If you match the Bulls-Eye number for the respective drawing, you’ll get an opportunity to win a higher prize. When playing Bulls-Eye, you’ll win a prize if you match solely the Bulls-Eye number or if you match the Bulls-Eye number and additional Hot Spot numbers. There are multiple ways to win a Hot Spot prize. The top prize is provided for matching 10 numbers and the Bulls-Eye. The prize is 300,000 dollars and the odds of this happening are 1 in 17,823,422. The prize for matching 10 spots without activating Bulls-Eye is 100,000 dollars and the odds are 8,911,711. People who play 9 spots and Bulls-Eye can hope for a maximum prize of 65,000 dollars and 9 spots minus the Bulls-Eye produce a top prize of 30,000 dollars. For eight spots, the prizes are 28,500 and 10,000 dollars for entries with Bulls-Eye and without it, respectively. Obviously, the prizes grow smaller for the players who have selected a smaller number of spots. The smallest prize in Hot Spot is 1 one dollar and there are several possible submissions that will produce the respective prize. The overall odds of winning a prize in Hot Spot are excellent, which is one of the main reasons why the game is so popular. The overall odds for 5 spot 1 in 10.3, Bulls-Eye, for example, are the impressive 1 in 16. Keep in mind that if there are multiple winners for the respective prize tier, the sum will be split equally among all of the winners. All players have 180 days from the date of the respective Hot Spot drawing to make a prize claim. If the money isn’t claimed within the specified timeframe, the prize will go towards the California public education fund. Prizes of 599 dollars or lower can be claimed at any licensed venue in California. Alternatively, players can download a claim form from the official California State Lottery website and mail it to the organization’s headquarters alongside the winning ticket. It’s always a good idea to sign the back of the ticket prior to making the prize claim! Prizes of 600 dollars or higher can be collected from a lottery district office in California. A full list of the addresses is available on the California State Lottery website. Alternatively, players can use the official claim form and mail their prize request to the California State Lottery headquarters. There’s a final piece of good news for winners. California is one of the states that have solely federal taxes for lottery prizes. A state tax isn’t applied to the sum, which keeps the sum that players get sufficiently high. Can You Buy Hot Spot Tickets Online? Hot Spot is a state-based lottery. This means that ticket purchases are possible solely on the territory of California. Both state residents and visitors can buy Hot Spot tickets from licensed retail venues. Online lottery agents don’t offer Hot Spot tickets for international sale at the time being. Would you mind rating Hot Spot? What’s the final verdict? Hot Spot is definitely worth trying! If you find yourself confused by all of the spots and available numbers, you can always try some of the other fun and exciting entries included in the portfolio of the California State Lottery. Good luck! It you to pay out decently until about 7 years ago. Now it RARELY pays out anything decent. Save your money and don’t play. Your odds are better at a casino. Very sad! Very fun and addictive game to play, definitely much better than scratchers, people who like faster results, hot spots play results are every 2 minutes, I got lucky few times playing 5 spots and the winning amount was $450.00. If you play this game then you to will notice how little the number of winners there are in each draw almost like the picks are being watch by the computer that draws the 20 numbers and somehow will select the fewest amount of possible winning picks as possible. But we still play. I’m wondering why the lottery doesn’t display the total number of picks per game and let the consumer be able to track this along with the breakdown of all the winning plays per draw. This is an easy software solution I’m sure… What could be the reason to not have the winning numbers per draw, the winning break down of spots and amount won per draw, how many tickets purchased per draw and a time stamp on the website so all of this info can be tracked and graphed. Come on the odds are on your side give us something to play with here. At least I would be able to graph what time of day would be the best times to play I want and need a little more for my buck a lot of people agree with me on this also. So let us have this one please. This is a cute little game with cute little wins. Me, I’ll stick to going after those mega jackpots. Add to that, you can only play this in California. I like the lotteries that can be played from anywhere. If I take a trip there (which is not going to happen soon), I might give it a ago.